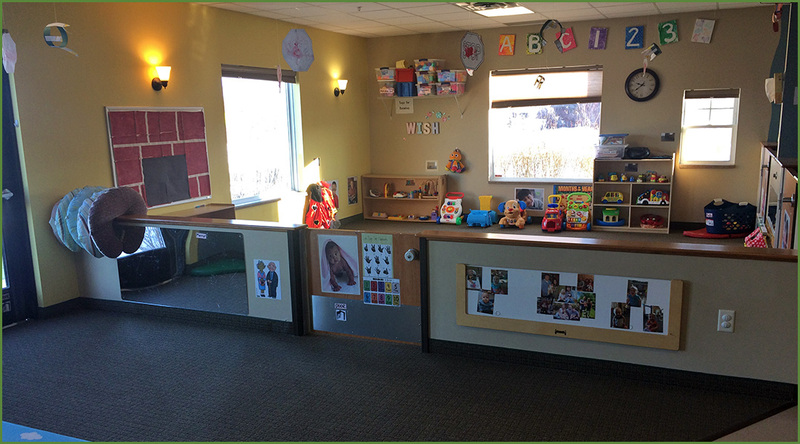 At Big Woods Child Care Center, we offer two infant rooms for our fast-growing and curious babies. Infant Room 1 is for ages ranging from 6 weeks to about 10 months, at which point they are moved to Infant Room 2 based on mobility and open spaces. Infant Room 2 is for ages 10 to 18 months. The ratio of staff to babies in our infant rooms is 1 to 4, with 1 staff member for every four infants. To communicate with parents, we use an Infant Communication Sheet, which is diligently and consistently filled out for each child. On this sheet, we log feedings (both bottles and solid foods), naps, changes in diapers, and any supplies needed. We also include a section for specific comments and observations. Our cribs at Big Woods are exclusive to the children, meaning each child is assigned a crib. The sheets for the cribs are provided by the center and are changed weekly unless soiled, in which case they are changed immediately. We utilize Safe Sleep Practices to reduce risk of SIDS by encouraging sleeping in cribs only, placing the babies on their backs while sleeping, and using sleep sacks (provided and washed by the center). For supplies, we request that each infant has formula (unless on breast milk) and three bottles, baby cereal and food (when needed), diapers and diaper ointment, an additional change of clothes, and a pacifier. When your child is ready, the center will provide any table food needed. If your baby is on breast milk, please bring filled bottles that are ready to use for feedings, transporting them in a small, cooler-style, insulated bag. Big Woods infants are fed bottles as needed throughout the day. When you request it, we will assist in the transition to solid foods. In Infant Room 2, babies are transitioned to table food only through communication with the parents, usually starting with Cheerios, crackers, fruits, and vegetables. Room 2 infants are certainly able to drink bottles and eat baby food. Infants eating solid food enjoy breakfast, lunch, and an afternoon snack. The policy for diaper changing is every two hours, unless needed more often. If a child’s diapering supplies run low, we will communicate with the parents to notify them of the need for more. To keep our infants active, we take them on stroller rides, weather permitting. Our older infants in room 2 are also taken out to the playground. 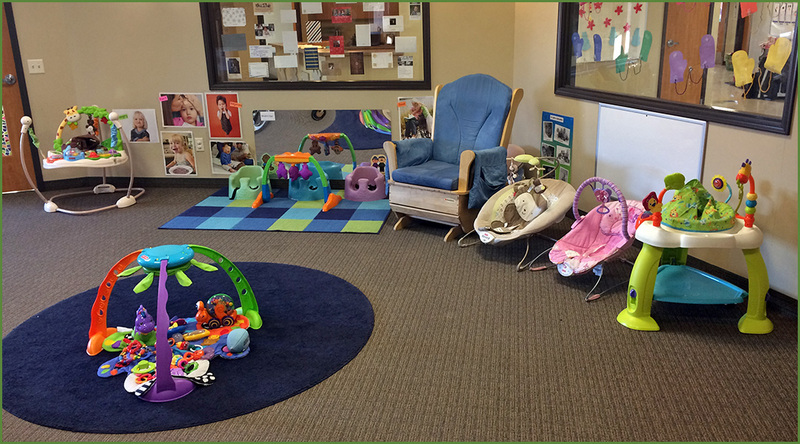 In inclement weather conditions, babies are allotted time to play in the gym space at the center. For our learning movers, we also encourage tummy time, jumpers, floor gym time, bouncy seats, and swings, as well as manipulatives like books, soft blocks, and a variety of other toys, all educational and age-appropriate. A typical day for our infants at Big Woods include play and learn time (exploring the room and toys and developing social skills), gross motor play (learning about the movement of their bodies), fine motor play (encouraging more specific body movements), music and movement time (learning about self-expression and music), and art/sensory time (adding to sensory learning).